A duck hunter in Florida got a painful surprise while wading in waste deep swamp waters when an alligator attacked him. 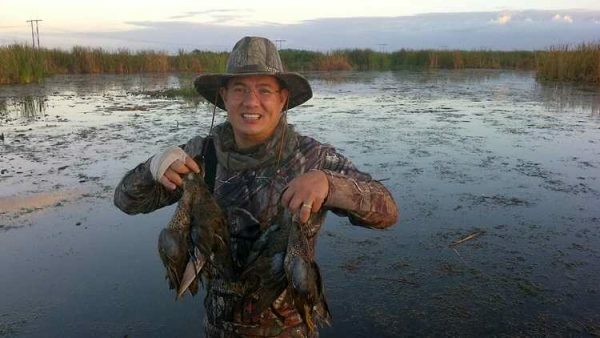 Krit Krutchaiyan, 50, was hunting with a buddy in Holey Land Wildlife Management Area, part of the Florida Everglades, when he was walking through the murky waters with his chest waders on. The two were walking through about waist deep water towing kayaks when the Coral Springs man spotted a log and kicked it. Turned out that log was actually an alligator. The gator, described as eight to ten feet long, responded viciously and bit the man in the leg, the Broward Sheriff Fire Rescue reported on Friday. The man’s friend managed to help shoo the creature away with his kayak while the victim worked a tourniquet around his leg to stop the bleeding. Luckily it did not sever the muscle or any arteries and is said to be recovering at a hospital after being airlifted from the scene. His friend told the Sun Sentinel the situation was shocking. “In a way, it was really scary because you know you’re in the alligators’ environment, you know they’re all over, but they tend to go away when they see humans because they don’t associate us with food.” Roberto Gautier told the paper. Similar to scuba divers around sharks, normally alligators are not a problem around people. But while alligator attacks like this one are extremely rare, it’s the second one in Broward County this year. Back in August, a 49-year-old woman nearly lost her hand when a 6 1/2-foot alligator reached through a dock at Willard Fish Camp and bit her. The woman had been reaching down to pick up a soda can that had rolled off the dock.